When I opened my in-box today, I received the Global Genes logos to support Rare Disease Day 2011 from the Global Genes Project. The logos are so cool — the work is being done by an amazing strategic communications consultancy and reputation management firm called Charleston | Orwig. The rare disease community is incredibly lucky to have such great people trying to help educate the world on rare diseases that affect millions of people worldwide. The majority of the 7,000 different rare diseases we know of are genetic in origin — that’s why the Global Genes Project is using jeans and denim as their awareness theme! 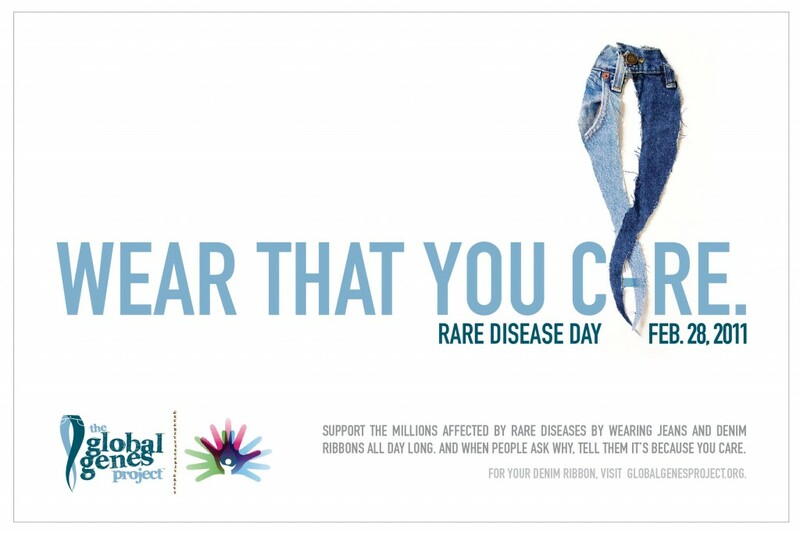 My entire family and a bunch of friends will be involved in the “Wear That You Care” denim campaign and will wear jeans and jean ribbons on Rare Disease Day on February 28, 2011. I have been asked to speak on Rare Disease Day at Pfizer’s event in Boston and you’ll find me in my jeans and wearing my denim blue ribbon! Please show your support by displaying this Global Genes logo for Rare Disease Day on your website and raise awareness for all people with rare diseases. We are so excited to give children like Addi and Cassi the chance to be heard by supporting the Global Genes Project. We are doing what we can to help out next month by donating a portion of our proceeds to the cause. Visit roozt.com or mydenimdevil.com to do so! We wish the very best for your family and the twins!